The bond between a loyal dog and a caring owner is unbreakable, even between life and death. 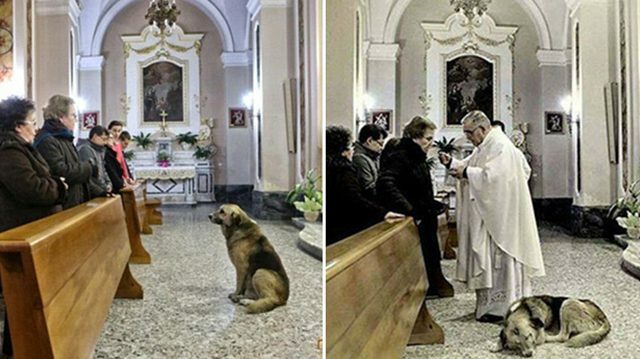 After his owner passed away, this loyal dog still attended the church every day to wait for his dead owner. 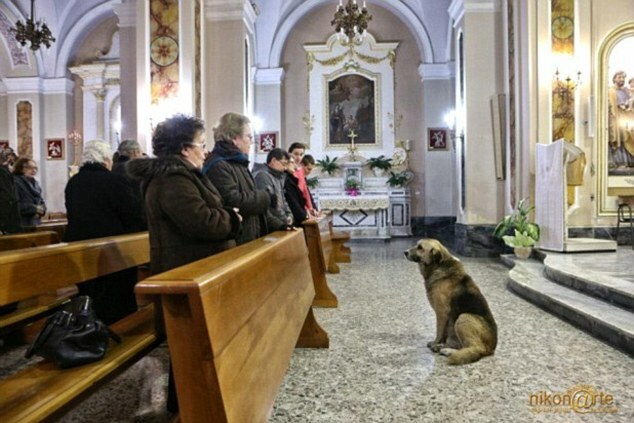 Tommy attended mass every day at an Italian church after his owner passed away, waiting for her to return. He was adopted by Maria Margherita Lochi, 57, when she found him abandoned in the field near her home in southern Italy. 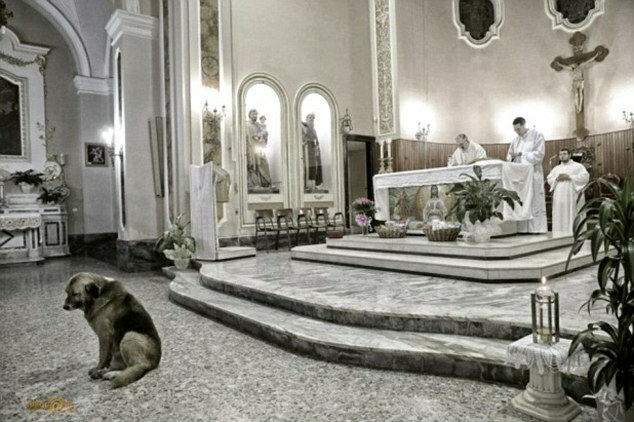 Both used to walk from home to church every day, to attend the church services together; Tommy always behaved well and therefore the priest allowed him to sit by Mrs. Lochi’s feet.The German shepherd Tommy sits patiently during Mass at the church where his late owner’s funeral was held. After Lochi passed away at San Donac in Brindisi, Tommy joined mourners at the funeral service in the church. Since then, he arrived the church on time every time when the priest celebrated mass. He was so well behaved that the priest allowed him to stay in the church during the service. “He’s there every time I celebrate mass and is very well behaved–he doesn’t make a sound, I’ve not heard one bark from him in all the time he has been coming in,” said Father Donato Panna. “He used to come to mass with Maria and he was obviously devoted to her–I let him stay inside as he was always so well behaved and none of the other parishioners ever complained to me. Tommy had been adopted by his late owner, Maria Margherita Lochi, after she found him near her house in Brindisi, Italy. Tommy and Maria attended the church together every day. The priest allowed him to sit quietly by her feet. Father Panna added that the hound had been adopted by the village community since his owner’s death, with caring villagers providing him food and water. “Tommy’s been adopted by everyone in the village now and he is everybody’s friend. Everyone looks out for him and leaves food for him – although it would be nice to find a proper home for him,” said Father Panna. This sad and touching story shows the bond established on unconditional love, care and trust is unshakable. Loyalty is one of the most beautiful traits people believe in and pursue in the world.